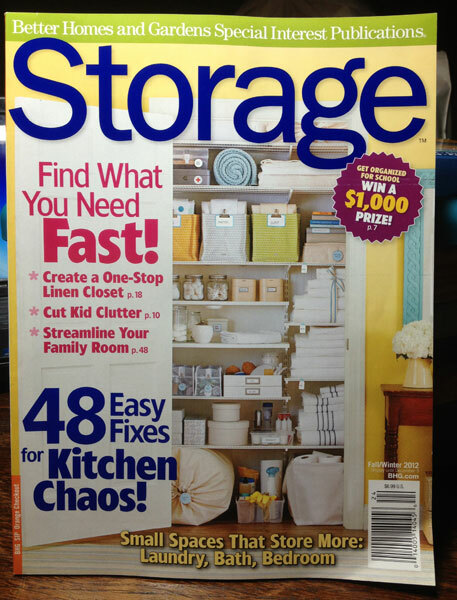 Page 25 of Storage Fall/Winter 2012, a Better Homes and Gardens Special Interest Publication. How awesome is this?? My designs are in a national magazine!! 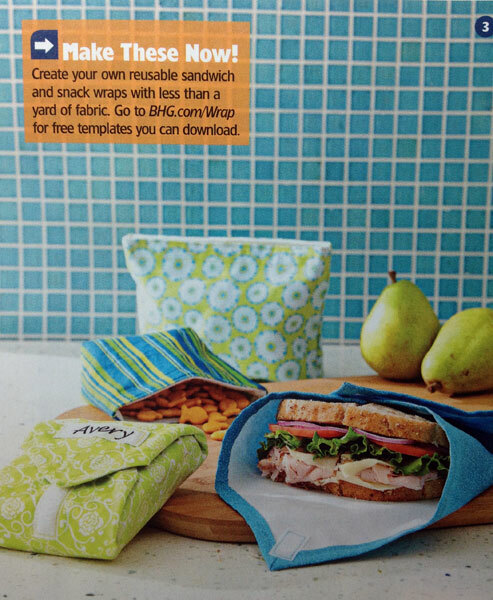 Earlier this last spring, I was asked by an editor of Storage magazine to design and sew some lunch storage pieces. I have been making various homemade items for friends for years, but never “took it public.” I didn’t have an Etsy store. I didn’t have a website. I had a Facebook page where I posted my creations for my friends to see, but that was it. That has now changed. My Etsy store is now up and getting a fair amount of traffic. It currently contains the sandwich wraps and snack bags that you will see in this issue of Storage (Fall/Winter 2012, Meredith Publishing), as well as an insulated lunch bag to carry everything in. But I won’t be stopping there. I also make felt story boards, purses and totes and costumes. I hope over time I will be able to offer all these things on my store, calicostrawberry.etsy.com. If you don’t see a pattern that you like, drop me a line. I take custom orders and we can find the perfect fabric for you. 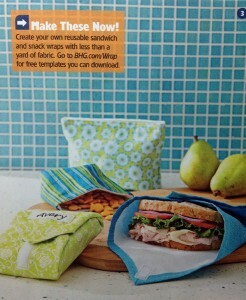 If you are crafty yourself and would like to make your own wraps and bags, check out the instructions for my designs. I have since made some alterations, like adding more Velcro strips on the wraps, and dropping the Velcro down a bit in the bags. This link includes patterns if you are using Fabric Quarters. And make sure you check out the entire Storage issue. There are several other amazing lunch storage items in the same story my pieces are in. And the entire issue is chock full of great ideas for storage and organization. Bear with me as I work on linking up all my social media. I promise some eye candy posts later. And by eye candy I mean the yummy cupcake fabric I picked up yesterday. Why settle for one, when you can have both? The bag is also lined with PUL and insulated with Insul-Brite. Since my 8 year old couldn’t decide on one fabric for his lunch bag, we decided to use both. He is more than excited and can’t wait to use it tomorrow. 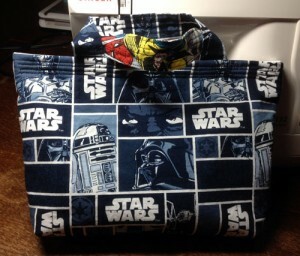 This is the same design that I will be using for the lunch bags that I will be selling in the store. They have plenty room for enough food, but are not so big that they take up a ton of room in a backpack. They are completely washable. Wipe with a damp cloth, or toss in the washer. So much better than the store bought bags that get gross after a few months. 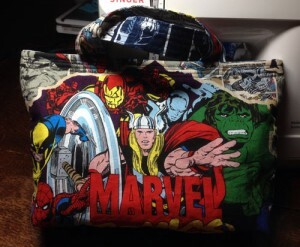 Flip side of the Avengers lunch bag. Now to start working on the sandwich wraps and snack bags. 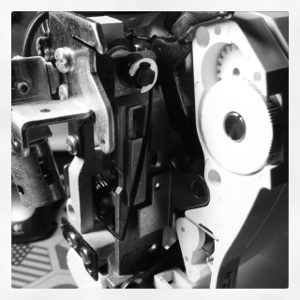 My sewing machine lightbulb burnt out for the first time in 7 years. I had to take it apart to change the bulb. Hi. Hello. Guten tag. Bonjour. Namaste. I think the first blog post is always the hardest blog post. Like a baby taking their first steps. So full of promise, but you usually end up on your face. I will start with baby steps. Hi. How are you? Did you have a good day? Let me tell you a little bit about myself. I am a mom, a wife, and a crafter. I have three kids, two cats and a dog. In general I consider myself a fiber artist, mainly because I can’t decide on one medium to work in. I like working with yarn, felt, cotton, paper and paint. I just started an Etsy store (http://www.etsy.com/shop/CalicoStrawberry) and this website/blog is a companion to that. I will post when new things go into the store, cool tricks I learn along the way, and really just anything that I think people might find interesting.